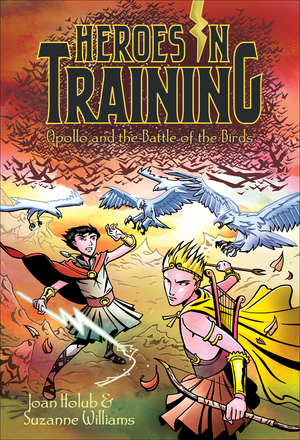 When a flock of angry birds threaten Zeus and his fellow Olympians, they need the help of a new friend—assuming the stranger is actually a friend! After a horrible drought, Zeus and his fellow Olympians are determined to help restore the land as they try to figure out their current mission, to find a special shield called an aegis. Thanks to some grateful villagers, who benefit from the rain and crops that the young Olympians magically create, they find the armor they need. But they are suddenly swarmed by birds—thousands of killer, scary birds. And when a mysterious boy appears in the chaos, it looks like he might be more connected to the Olympians than they think. Is he friend…or foe?